Juicy beef smothered in a creamy mushroom and onion gravy. 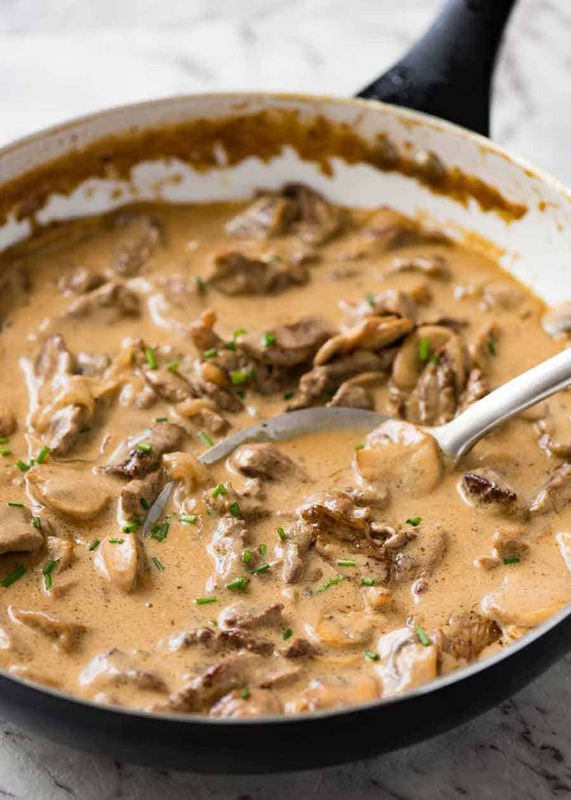 Beef Stroganoff is a crowd favourite that tastes like a slow cooked stew but is on the table in 30 minutes! 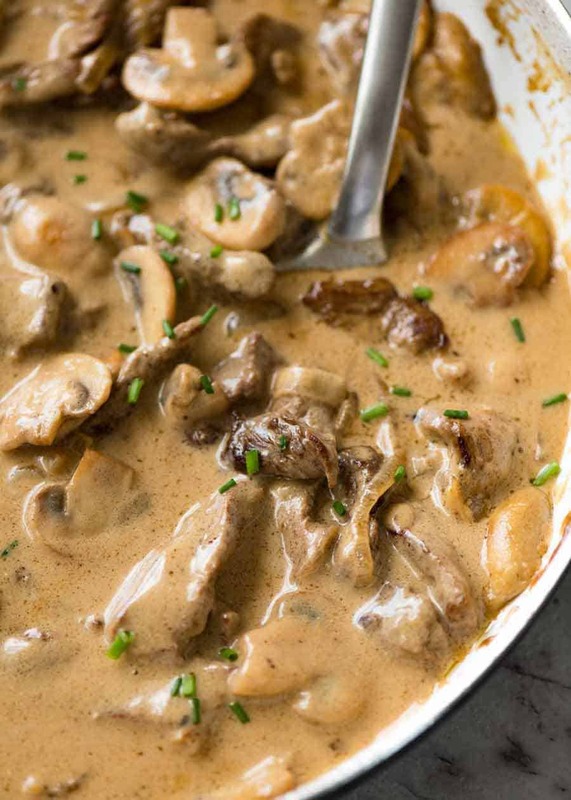 Beef Stroganoff – a timeless retro classic!!! 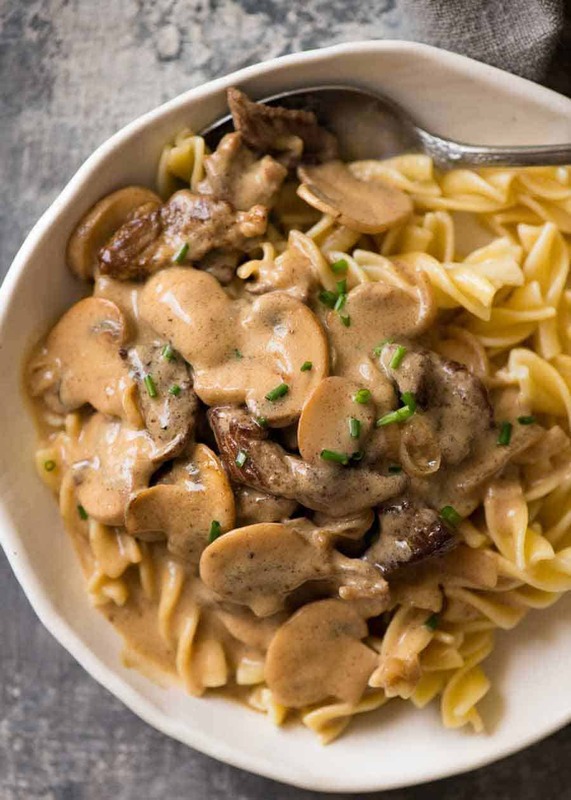 If you’ve ever chewed your way through dry, overcooked beef, you’re going to LOVE this Beef Stroganoff recipe! Just two simple rules for juicy, tender beef – using the right cut and the 30 Second Sear ( <– PS I totally made up this name). But if you want to make this retro classic the way it’s intended and to experience all that Beef Stroganoff is when the beef is tender, juicy perfection, then there’s no getting around the fact that you will need a decent quality steak that’s nicely marbled with fat. I know, I know, you see juicy steaks like the scotch fillets above and your instinct is to throw them on the barbie. Thin strips of beef like these overcook in a flash. But forgoing the sear would be a blasphemy (in my books). Sear = flavour on both the beef AND in the gravy. If you’re wondering if the beef is still raw inside at this stage, yup, it sure is. As I said, these are pretty thin strips of beef, and now that we’ve sealed the juices inside with the sear, we’re going to finish cooking them in the gravy right at the very end. 1 minute simmering in the gravy is all it takes – the beef continues cooking in the residual heat when you take the skillet off the stove. RECIPE VIDEO ABOVE. 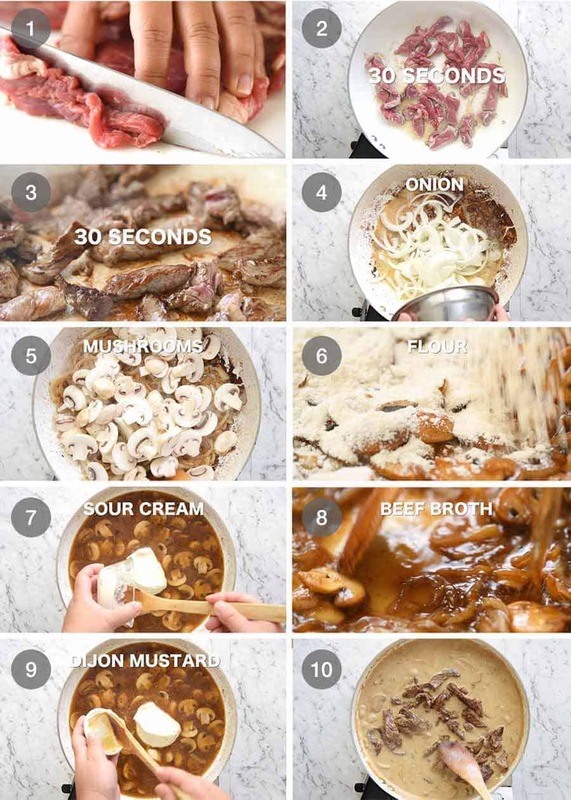 Juicy strips of beef smothered in a sour cream mushroom gravy – a quick dinner everyone will love! KEY STEPS: Sear beef super quickly for maximum juiciness and use a large skillet (for quick sear + fast sauce reduction). 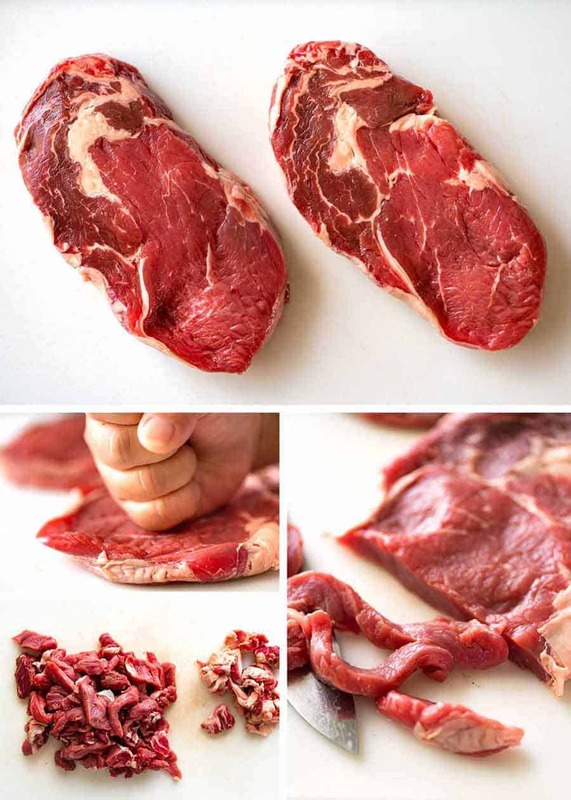 Use your fist (or rolling pin or mallet) to flatten the steaks to about 3/4cm / 1/3″ thick. Slice into 5mm / 1/5″ strips (cut long ones in half), discarding excess fat. Heat 1 tbsp oil in a large skillet over high heat. Scatter half the beef in the skillet, QUICKLY spread it with tongs. Leave untouched for 30 seconds until browned. Turn beef quickly (as best you can!). 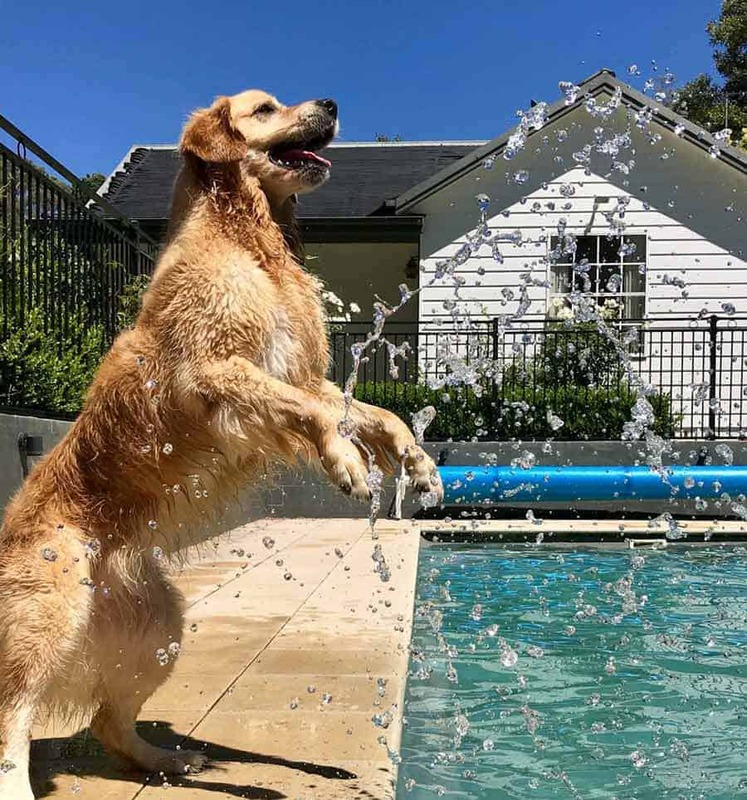 Leave untouched for 30 seconds to brown. Immediately remove onto a plate. Don’t worry about pink bits and that it will be raw inside. Stir, then add sour cream and mustard. Stir until incorporated (don’t worry if it looks split, sour cream will “melt” as it heats). Bring to simmer ,then reduce heat to medium low. Once it thickens to the consistency of pouring cream (3 – 5 minutes), adjust salt and pepper to taste. 1. Stroganoff is best made with a decent to good quality quick cooking cut of beef because the dish is cooked quickly. I used 2 x beef scotch fillets (aka boneless rib eye) which is pretty well marbled with fat and you can find reasonably priced ones at butchers and supermarkets. Sirloin, rump and any other steak for BBQ-ing is suitable, except I don’t recommend skirt, flat iron and cuts like that which need to be virtually rare to be juicy and usually work best when marinated. Tenderloin is also suitable BUT it is leaner. Pork can also be used – pork stroganoff is found in Russia too. 2. Any wheat flour is fine here, I use plain white flour (all purpose). Or use 1 tbsp cornstarch / cornflour (makes it Gluten Free). 3. I like serving this with short, curly pasta. I like it best with short pastas, rather than long pastas. It’s also great with mashed potato, rice, polenta – anything that’s suitable to slop up all that gravy! 5. KEY STEPS in this recipe: brown very quickly so the beef is still raw inside, then finish cooking through in the gravy. The more colour you can get on the beef in 30 seconds on each side = more flavour in the end result. Do not worry about pink bits remaining on some of the beef after the sear and that it’s raw inside – it is more important to get the beef out of the skillet after 60 seconds! The other key steps is to use a LARGE SKILLET. Key for beef browning / fast sauce reduction. Recipe originally published January 2018. Updated for housekeeping things in September 2018, no change to recipe! 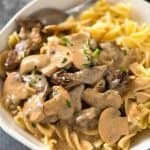 The post Beef Stroganoff appeared first on RecipeTin Eats.